Before ruins, there was rubble. This is the startling and counter-intuitive claim at the heart of Gastón Gordillo’s magnificent new book. It is counter-intuitive because we tend to think of rubble as an extrapolation of ruination, ruination taken to the nth degree. Rubble is what we are left with when we don’t even have a ruin, when the forms of ruined structures are no longer comprehensible, leaving us with little more than shapeless masses of material and debris. Rubble is what ruins ultimately become, if left to their own devices; they are what ruin the ruin itself. If ruins are a palimpsest, rubble is their holocaust. If in the ruin, as Walter Benjamin observes, “the idea of the plan speaks” (The Origin of German Tragic Drama 235), and we can think we imagine a completed building, a unified structure, by contrast in the mound of rubble little can be discerned. Rubble is illegible, seemingly mute and expressionless; it defies representation. Or if rubble speaks, surely it tells us only of the extreme violence that has silenced it, that has erased the history that it once incarnated? No, says Gordillo: quite the opposite. Rubble’s apparent formlessness is an indication of its generative potential. From heaps of rubble mighty ruins spring. Gordillo’s book, then, is a wide-ranging account of the production of ruins from rubble across a swathe of Northern Argentina from the foothills of Andes to the Paraguayan border, in the once forested plains of the Gran Chaco. He shows how diverse forces, from the Spanish conquistadors to the colonial Church or the contemporary state, have at various points tried to seize hold of the rubble that litters the region and capture it to produce what (following David Harvey) we might call a “spatial fix” to cement power, shape memory, and organize bodies, human and material alike. For even “naming something a ruin” is, as Gordillo quotes Ann Stoler saying, “in itself a political act” (196). Ruination is a process of selection that negates certain potentialities that remain virtual within rubble, even as it actualizes and celebrates others to produce “deceivingly positive landscapes” (16) punctuated by fetishized monuments to an official version of the past. If there is anything negative in the ruin it is this: the ruin sets out to negate rubble and with it its generative power and complex multiplicity. Against the flexibility and fluidity of what seem to be unformed mounds of material, scattered here and there in all manner of combinations, ruination produces “rigid objects presented as nodes of memory” that “transform space by gathering bodies around them and organizing and modulating their gaze and affective disposition” (206). But with rigidity comes brittleness. It’s no wonder that these ruins become objects of ritual veneration that require “repetitive ceremonies that something worth remembering happened there” (206). Ruins have to be endlessly (at)tended, reconstructed, shored up, rebuilt. Hence the irony that there are no structures more carefully conserved and preserved than ruins, supposed monuments to impermanence and decay that are in fact shaky bulwarks of projects to ensure stability and purity. Ruins have to be kept “whole” to hide the fact that all great structures are only ever ruins in waiting, and that everything tends to return to rubble. Ruins are the precarious legitimation of sovereign power; built on rubble, in the end they are not so mighty after all. For the transformation of rubble into ruin is not a one-way process. Ruination is not rubble’s destiny, and Gordillo’s history is also the tale of constituted power’s constant battle with rubble’s perennial resurgence. While the elite battle against rubble, perpetually in fear of the ways in which it manifests “the fragility of state power” (57), or indeed the failures of any other would-be hegemonic project, in and around the debris itself arise other practices, other memories: subaltern reappropriations of place, such as the wild parties (“fiestones”) and “exuberant events of a Dionysiac nature” that one of Gordillo’s informants tells him used to take place in an abandoned Jesuit mission. It is this same informant, a local man called Alfredo, who first shocks Gordillo into realizing that if “we aren’t afraid of ruins” (as his Conclusion has it), it’s because we fear rubble even less. Calmly breaking off pieces of stucco, “enthusiastically eroding the materiality of the wall” (4), Alfredo happily demonstrates the vulnerability of ruins, their susceptibility to a subaltern counter-violence. Sous les pavés, la plage; beneath ruins, rubble. But what comes before rubble? Or is history simply some kind of endless dialectic between rubble and ruin, violence and counter-violence? No. Gordillo suggests that before rubble is the void. But void does not here mean absence of any kind. It is true that Gordillo has much to say about negation, and in general his book is often dressed up in Frankfurt-School and particularly Adornian and Benjaminian rags. But his is an Adorno who, in proper Deleuzian fashion, has been well and truly fucked in the arse. So despite imperial or national depictions of the Chaco as some kind of savage abyss, defined by everything it supposedly lacks (culture, order, hierarchy), Gordillo stresses its plenitude, indeed its multiplicitous excess. This is what truly makes elites tremble: not that there is nothing there, but that there is too much, as is evidenced by the void’s power to create rubble. For perhaps it is better to speak not of the void, as though it were one object among many, but of voiding as an activity, as an insistent presence, a vital expression of the war machine as constituent power that (here Gordillo references Pierre Clastres) exerts its own violence to ward off the state, and in so doing creates rubble. The difference between the void and rubble is that the void is truly formless, a smooth space of pure immanence. 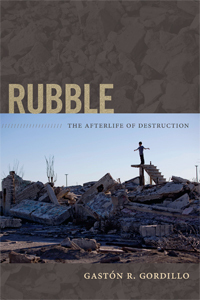 Rubble, by contrast is organized (much as the state cannot see this or has to deny it) in zones of intensity, or what Gordillo consistently calls “nodes,” which themselves constitute “constellations.” This makes sense of the description of rubble as “ruptured multiplicity” (2), as opposed to the “ruptured unity” that more conventional accounts suggest. For it is not unity but multiplicity that is prior, and it is this basic (pure) multiplicity of the void that rubble ruptures. Gordillo wants to persuade us not to fear ruins, in the name of a plea that we appreciate and affirm rubble. But should we not then love the void even more? Is this a radical call to embrace the war machine, reversing all the polarities of constituted power? Again, no, for this is not a book tainted with nostalgia for the so-called primitive, nor does it surrender to banal dialectics. There is something deeply ambivalent about the void. And we can see why if we look at the latest forces to shape the landscape of the Argentine Chaco: truly “primitive” accumulation in its purest state; neoliberal agribusiness as incarnated in the so-called “Soy Boom” of the past couple of decades. For what marks the process by which the forests are destroyed to be replaced by vast fields of soy is that the devastation is near absolute: not even rubble is produced or left behind, while the rubble that was once there is now consumed by fire. This is truly a smooth space. Moreover, there is something of the nomad, something of the war machine and even something multitudinous in these new multinational forces sweeping through the Chaco. Their voiding is certainly vigorous and active, and ultimately as threatening to state sovereignty as marauding indigenous bands ever were. These are the new spectres that haunt the Chaco, constituting lines of flight in pursuit of capital that (as Deleuze and Guattari comment in another context) “emanate a strange despair, like an odor of death and immolation, a state of war from which one returns broken” (A Thousand Plateaus 229). In the face of this latest challenge to the Argentine (but not just Argentine) spatio-historical ecosystem, it is the signal merit of Gordillo’s book to remind us of the value of the loose, but productive and fertile, horizontal connections and communities that make up the network of nodes and constellations that we too easily dismiss as “mere” rubble. 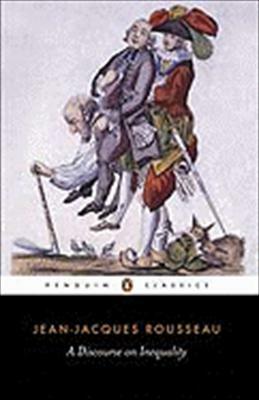 In the Discourse on Inequality, Jean-Jacques Rousseau sets out to turn Thomas Hobbes’s famously pessimistic account of “natural man” on its head. Where for Hobbes life in the state of nature is “nasty, brutish, and short” as everyone struggles against each other in a “war of all against all,” for Rousseau it is a form of existence characterized by self-sufficiency and relative harmony: “these men’s disputes would seldom have had bloody consequences” (102). We can prove this empirically, indeed, by looking to the New World: “the Caribs, who of all peoples existing today have least departed from the state of nature, are precisely the most peaceful in their loves, and the least subject to jealousy” (103). This relative tranquility in the state of nature stems less, Rousseau argues, from any innate human goodness (indeed, the opposition between “good” and “evil” scarcely makes sense in such a situation) as from a number of more pragmatic considerations. First, as each of them is effectively self-sufficient, primitive humans have no need (and no desire) to maintain extended contact with each other. Beyond answering the call of sexual desire to mate (a singularly unromantic process, in Rousseau’s account) and reproduce, they keep themselves to themselves. Second, when they do meet, natural inequalities–of size or strength or speed, for example–are relatively minor; there would seldom be any obvious advantage in starting a fight, especially given that one could satisfy one’s needs for food and shelter etc. on one’s own. And third, any aggressive impulses are kept in check by a more fundamental sense of compassion: “It is pity which in the state of nature takes the place of laws, morals and virtues, with the added advantage that no one there is tempted to disobey its gentle voice” (101). It is then (and this is Rousseau’s main argument) society that will create divisions, by accentuating natural inequality and adding to it the burdens that are artificial inequalities of wealth, rank, honour, and so on. So whereas for Hobbes, we are all equal before the law, because we are all equally lowly in the face of the Leviathan’s supreme power (for this reason, if no other, he is a classical liberal), for Rousseau civilization introduces difference–and, what is more, an awareness of difference (pride)–and therefore discord as we compete for status and to satisfy artificial needs. If there is a “war of all against all,” it is propelled by the fact that “inequality of influence and authority soon becomes inevitable among individuals as soon as, being united in the same society, they are forced to compare themselves with one another and to take into account the differences they discover in the continual dealings they have with one another” (132). This is the hectic social whirl, the “petulant activity of our own pride” (115) that makes social life uncertain and unstable. By contrast, the life of a savage is also, then, one of singularly low intensity. Indeed, it is a life of “indolence” (115) that is scarcely ruffled by the slightest affect. Where Hobbes sees primitive man in terms of panic and fear, for Rousseau the passions are overwhelmingly artificial. Affect is the product of society and habit: there is nothing particularly natural about either love or hate, happiness or sadness, fear or joy. And even Rousseau (Romantic that he was) had to thank socialization for finally teaching us to feel. La posthegemonía es una modalidad de práctica teórica en la que caben innumerables tipos de análisis y tomas de postura, pues no es ni normativa ni prescriptiva: es sólo, y por lo pronto, el lugar de un posible encuentro capaz de generar pensamiento nuevo. El término incluye de antemano su posibilidad crítica y resulta tan apropiado para pensar problemáticas estatales, es decir, en el registro del estado mismo y de la política de estado, como intra- o extraestatales (microfísicas comunitarias, regionales, ciudadanas o rurales, o bien macrofísicas de la globalización y su impacto), de marea rosada o neoliberales, populistas o no. Y en la medida no menor es que su productividad crítica está lejos de reducirse al pensamiento de lo político: constituiría también una herramienta fundamental para pensar la cultura, y con ella todas las modalidades de presentación de lo visible (estéticas, poéticas) al margen de postulados meramente identitarios. Tiene la capacidad de intervenir en cuanto crítica del conocimiento porque es antes que nada crítica de la ideología, y tiene la capacidad de proponer rearticulaciones políticas e intelectuales de todo tipo. Alberto Moreiras, “¿Puedo madrugarme a un narco? 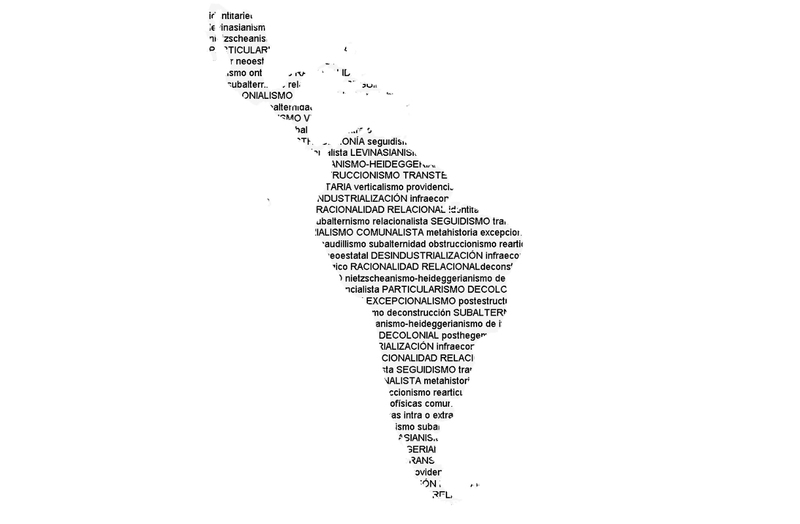 Posiciones críticas en la Asociación de Estudios Latinoamericanos”. FronteraD (June 27, 2012). Jason read has written a very interesting commentary on Benjamin Noys‘s book The Persistence of the Negative . It makes me all the more eager to read it–if only it weren’t so damn expensive–even though (or perhaps especially because) my tendency, like Read’s, is towards what we might call the philosophy of affirmation. But in Read’s words, Noys “is not interested in positing an ontology of negativity against the ontologies of affirmation. Negativity is a practice, not a principle, a destruction of existing positivities.” And here I sense I agree with Noys. I’m likewise far from convinced by (say) Negri’s unremitting championing of the multitude. As I point out in Posthegemony , we still need to be able to distinguish between good multitudes and bad, and to be able to discern when the multitude turns bad. Or to put this another way: a philosophy of affirmation does not for all that have to be unrelentingly affirmative. Not everything is to be affirmed. I agree also that the problem with Latour (and, I would add, Delanda) is that they present something of a mirror image of Negrian affirmation, in which it is rather contemporary capitalist relations (instead of the coming Communist utopia) which is relentlessly affirmed. Where Negri claims that “What ought to be, is,” Latour and Delanda simply affirm that “What is, is what ought to be.” Either way, critique is discarded. And I am happy to agree in principle with the notion of negativity as “an insistence on localizing thought and practices, resisting both an ontology of affirmation and an ontology of finitude.” Again, in large part, this is what I aim to show with the Latin American case studies in Posthegemony .